Got coverage on a local news station. Never aired due to Florence. FIVE different Teslas came! We did not know how many people or how many EVs to expect but we were at capacity for our space! JC Moore, Lori Lawrence, Sherry Whitmore, Jennifer Connelly, Ellen Oberle, Isadora Avett, Karen Steinmetz, Derek Norrick, Holger Meyer, kneeling Kent Rowe. The entire crew that planned the event celebrating our success! Drivers love their electric vehicles. 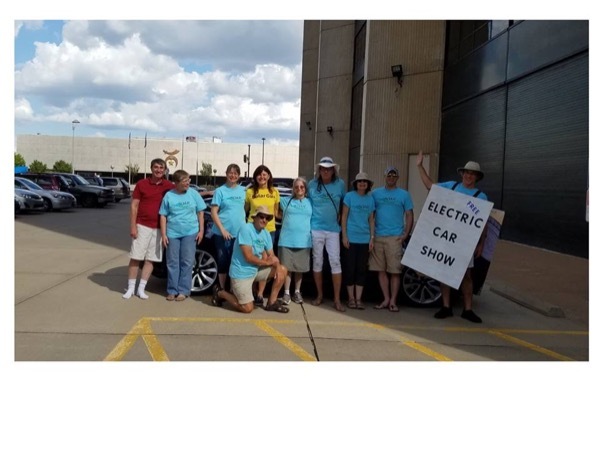 Whether you're an EV-driving enthusiast or are interested in joining the ranks, National Drive Electric Week is for you! We will be at the Westar Energy office in downtown Wichita. Yes! Westar! Come and see a charging station up close! Bring your EV for a free charge! Meet Society of Alternative Resources to ask questions and see the latest models! We will have Nissan, Chevrolet, Kia and Ford there. If you know of other dealers, please let us know! IF YOU DRIVE AN ELECTRIC VEHICLE, PLEASE BRING IT! We have the entire parking lot so plenty of space. Register your vehicle on this page! Registered attendees report 99,213 electric miles driven.